The CUORE-0 collaboration just announced a result: a new limit of 2.7 x1024 years (90%C.L.) on the halflife of neutrinoless double beta decay in 130Te. Or, if you combine it with the data from Cuorecino, 4.0×1024 years. A paper has been posted to the arXiv preprint server and submitted to the journal Physical Review Letters. 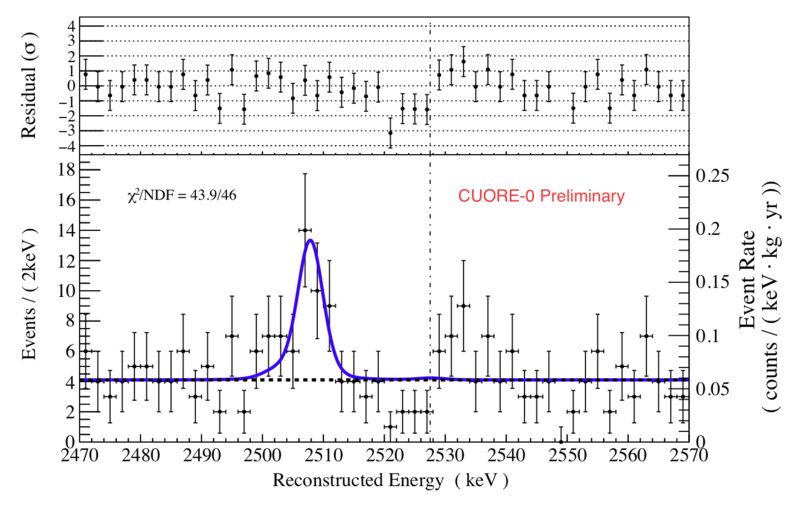 Bottom: Energy spectrum of 0νββ decay candidates in CUORE-0 (data points) and the best-fit model from the UEML analysis (solid blue line). The peak at ∼2507 keV is attributed to 60Co; the dotted black line shows the continuum background component of the best-fit model. Top: The nor-369 malized residuals of the best-fit model and the binned data.370 The vertical dot-dashed black line indicates the position of371 Qββ. From arXiv. CUORE-0 is an intermediate step between the upcoming full CUORE detector and its prototype, Cuoricino. 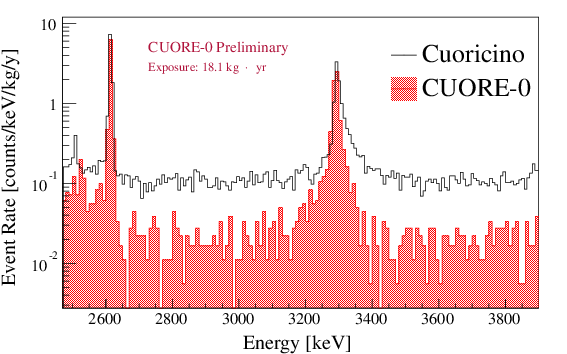 The limit from Cuoricino was 2.8×1024 years**, but this was limited by background contamination in the detector, and it took a long time to get to that result. 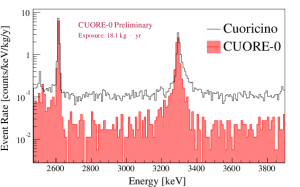 For CUORE, the collaboration developed new and better methods (which are described in detail in an upcoming detector paper) for keeping everything clean and uniform, plus increased the amount of tellurium by a factor of 19. The results coming out now test and verify all of that except the increased mass: CUORE-0 uses all the same cleaning and assembly procedures as CUORE, but with only the first of 19 towers of crystals. It took data while the rest of the towers were being built. We stopped taking CUORE-0 data when the sensitivity was slightly better than Cuoricino, which only took half the exposure time of the Cuoricino run. The resulting background was 6 times lower in the continuum parts of the spectrum, and all the energy resolutions (which were calibrated individually for each crystal each month) were more uniform. So this is a result to be proud of: even before the CUORE detector starts taking data, we have this result to herald its success. 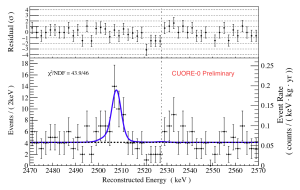 The energy spectra measured in both Cuoricino and CUORE-0, displaying the factor of 6 improvement in the background rates. From the seminar slides of L. Canonica. The result was announced in the first seminar in a grand tour of talks about the new result. I got to see the announcement at Gran Sasso today–perhaps you, dear reader, can see one of the talks too! (and if not, there’s video available from the seminar today) Statistically speaking, out of these presentations you’re probably closest to the April APS meeting if you’re reading this, but any of them would be worth the effort to see. There was also a press release today and coverage in the Yale News and Berkley Labs news, because of which I’m making this post pretty short. There are also two more papers in preparation, which I’ll post about when they’re submitted. One describes the background model, and the other describes the technical details of the detector. The most comprehensive coverage of this result will be in a handful of PhD theses that are currently being written. **Comparing the two limits to each other is not as straightforward as one might hope, because there were different statistical methods used to obtain them, which will be covered in detail in the papers. The two limits are roughly similar no matter how you look, and still the new result has better (=lower) backgrounds and took less time to achieve. A rigorous, apples-to-apples comparison of the two datasets would require me to quote internal collaboration numbers.